This site is maintained by Steven T. Duke. Steve "studied" abroad as a two-year old, when his father led a program in France. He lived in Finland for two years in the 1980's, where he became fascinated by Finnish history as well as the history of Russia and the Soviet Union. He completed his Ph.D. in Russian history at Indiana University, where he studied the history of primary schooling among ethnic and religious minorities in three provinces of the Russian Empire between 1885 and 1914. He spent a year in Russia doing archival research in St. Petersburg, Nizhnii Novgorod and Saratov. 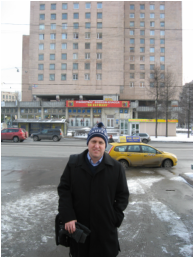 He also spent two months in Tartu, Estonia, researching the history of Estonian communities in St. Petersburg. Steve has been active in international education for the last two decades. He has taught Russian, European and world history courses at Wake Forest University, the University of Wisconsin-Madison, and Brigham Young University. He has worked with study abroad students and international students at the University of Wisconsin-Madison, Virginia Tech, and Wake Forest University. At Wake Forest University, he oversaw and taught in the Cross-Cultural Engagement Program, a unique set of three courses available before, during and after study abroad. He also developed the annual WISE Conference and turned it into the premier professional conference on intercultural learning during study abroad. Steve currently serves as Assistant Vice President for Global Strategy and International Initiatives at the University of Nebraska System.